A ruthless ETF fee war escalated this week with Vanguard announcing 1,800+ ETFs (pretty much every ETF except leveraged and inverse) will be available commission-free through their online brokerage platform. Because ETFs trade intraday like stocks, investors typically pay a small ticket charge ($5 – $10) to buy and sell shares – no different than when trading shares of Apple or Facebook. While representing a tiny fraction of overall portfolio costs (especially for well-disciplined investors who resist the urge to overtrade), commissions are still a cost of investing. Anytime fees can be reduced, investors win. But there’s more to Vanguard’s move than meets the eye. Over the past several years, a growing number of brokerages including Charles Schwab, Fidelity, and TD Ameritrade have rolled out commission-free ETF platforms. For example, Charles Schwab offers 200+ commission-free ETFs from providers such a State Street, Invesco, and WisdomTree, as well as their own low cost ETFs. Of course, nothing good is ever really free. 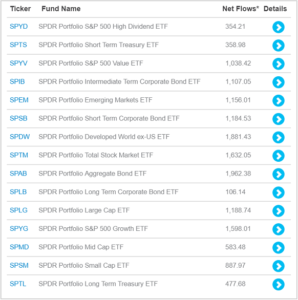 Behind the scenes, most ETF providers pay to have their ETFs included on these platforms (note paying for distribution isn’t unique to ETFs; it’s been going on for years in the mutual fund space). Brokerages are for-profit companies and need to get paid for services rendered. If investors aren’t paying trading commissions, the money has to come from somewhere. Why? Well, number one – they don’t have to. They’re Vanguard. While other ETF providers may struggle to bring in assets and gain visibility around their brands, Vanguard takes in $1 billion/day(!) 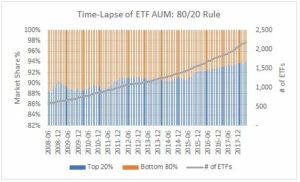 across their ETFs and mutual funds. 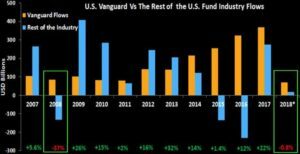 Number two, Vanguard is relentless about driving down the costs of investing – which obviously goes hand-in-hand with why they rake in a billion dollars a day. Because Vanguard is so unrelenting on reducing investor costs, TD ran into a tiny little problem including Vanguard ETFs on their commission-free platform. Investors and advisors flocked to these ETFs, meaning TD didn’t make any money. Remember, Vanguard doesn’t pay for inclusion on these platforms and the ETFs traded commission-free. Worse, Vanguard sucked money away from other ETFs on TD’s platform, where assets are typically the key driver in the pay-to-play formula. TD attempted to solve this dilemma by booting Vanguard off the platform and replacing them with a fund company who would pay. Vanguard’s response? Go nuclear. Offer nearly every ETF commission-free on their brokerage platform. While costs are always front and center for Vanguard, this move is also about transparency. Vanguard is shining a bright light on the pay-to-play model, which inherently has conflicts of interest. Investor dollars should flow to funds based on merit, not because they appear on commission-free lists. Smaller ETF companies without the budget to pay for distribution should have the same opportunity as larger companies. To be clear, there’s nothing nefarious about commission-free platforms at brokers like Schwab and Fidelity. They should absolutely be compensated for services they provide. There’s also nothing wrong with fund companies attempting to market their ETFs. The problem is that the current model is broken. Vanguard is attempting to blow it up.